This research is motivated by a real-life hybrid flowshop scheduling problem where jobs are organized in families according to their machine settings and tools. This type of problem is common in the production process of standard metal components. The problem is complicated by the requirement of family setup time when a machine changes from processing one job family to another and the formation of job families varies in different stages. This problem has been previously solved with a non-delay scheduling heuristic in which no machine is kept idle. 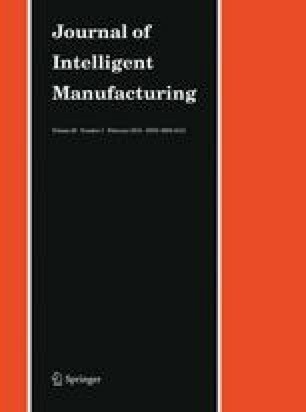 This research illustrates that inserting intentional idle time into a non-delay schedule can further reduce the total setup time as well as makespan. With the inserted idle time, the non-delay schedules are extended to active schedules. This paper presents a mechanism to determine the locations and lengths of intentional idle times in the efficient active schedules. Four active scheduling approaches are developed by integrating two types of waiting factor operators into two non-delay approaches. Computational experiments have been conducted to compare the proposed active scheduling approaches in terms of effectiveness and efficiency. The results have shown that the proposed active scheduling approaches are superior to non-delay scheduling. The analysis of variance has been applied on the factors related to scheduling environment, problem size and scheduling approach. The analysis has identified factors that are most influential on the scheduling result. This paper is supported by National Natural Science Foundation of China (51105081), Guangdong Natural Science Foundation (S2012010010016), National Science and Technology Ministry of China (2012BAF12B10), Industry-University-Research Cooperation Key Project of Guangdong Science and Technology Commission (2011B090400409), Guangdong College Talent Import Scheme (11ZK0066), Guangzhou Pearl River New Star Fund Science and Technology Planning Project (2011J2200017), and HKU Seed Funding for Basic Research (201111159135). Partial financial supports from Zhejiang, Hangzhou and Lin’an governments are gratefully acknowledged.